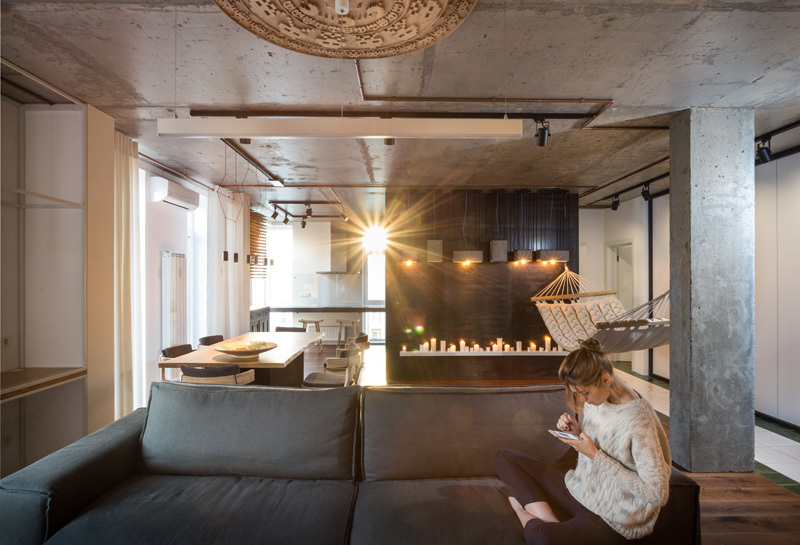 A serene and relaxing apartment transformation with natural materials. 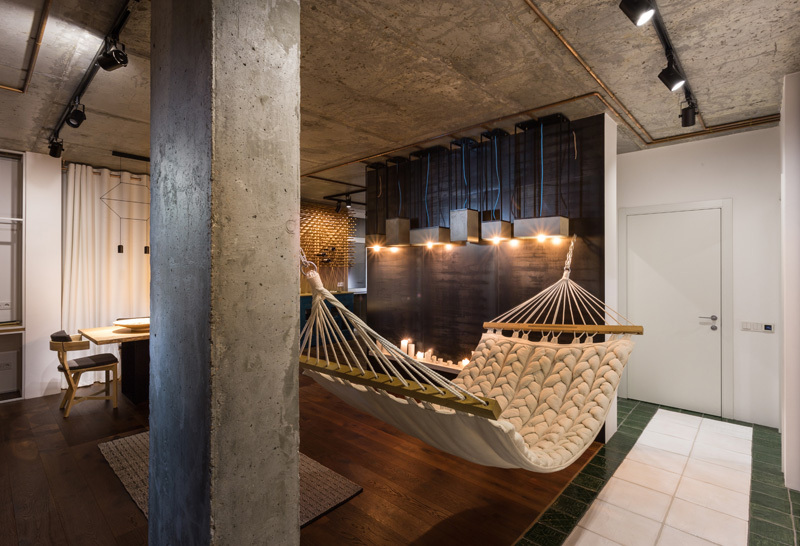 Even if you are residing in the middle of the busy and noisy city, it is important that you have a place where you can rest and spend some quite time alone or with a partner or with the entire family. This way, you will have time to relax and feel at peace. That is why it is very important to have a home where you can spend time as if you are away from the busy life. Your home would then be a perfect place for de-stressing and you don’t have to go far in order to feel calm and serene. 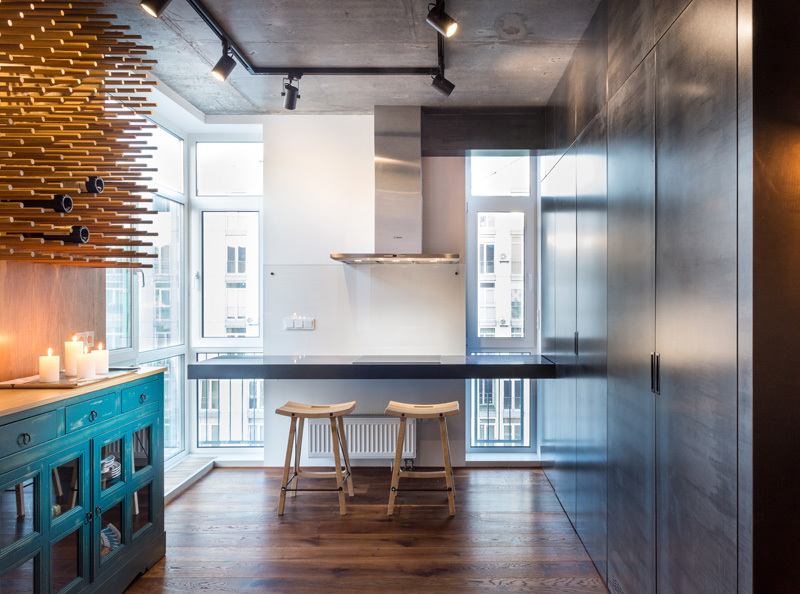 A three room apartment in Kiev, Ukraine was designed by SVOYA studio and transformed it into more open floor plan that the clients requested. Of course, an open floor plan is always better than the ones with many closed walls which dwarf a space. 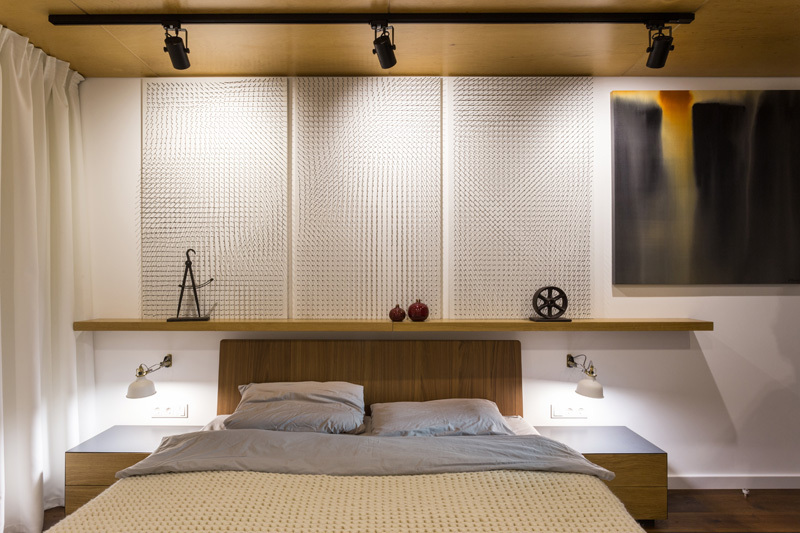 The apartment looks very relaxing because of its choice of materials, colors and lightings. What add to its warm and serene aura are the natural materials used in it as well as the manner of its arrangement or layout. There are also different textures that we can see in the interior that adds to its visual appeal. Overall, the interior is indeed very nice and would be conducive to de-stressing. Let us take a look at the images of the interior below. Unique feature: A modern apartment transformation from three rooms to one open-layout space creating a relaxing and serene aura as it combine natural materials and dramatic lighting. The space seems to have everything one needs for comfortable modern way of living. The interior is really very nice and well-planned from the choice of materials, furniture and lighting. 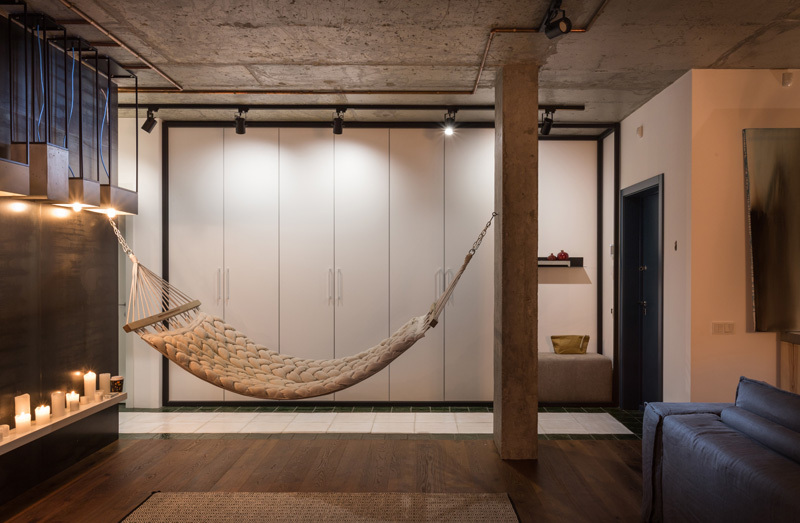 What welcomes you to the apartment is variety of natural materials that includes a woven comfy-looking hammock. Imagine yourself swinging on this. One glance at the apartment will make you realize that everything in it was made for a quiet peaceful life in the city. When you get to see the interior of the apartment, you would love the entire look from the wooden dining set, hammock, unfinished columns and ceiling and the comfy gray sofa. Even its lighting is pretty amazing. The living room looks really relaxing with a brush of sophistication in it. There’s a feature wall of wood shingles behind the TV. Seen here is a simple dining space that joins the living area to the kitchen area. The design of the chairs is beautiful! This is one item that will arise interest to anyone who sees the apartment. Installed on the ceiling is a gaming inspired wood medallion that has Space Invaders and Pac-Man carvings on it. Very mutinously done indeed! Instead of a blank wall, pendant lights were added to bring some visual interest the area and it also looks pretty nice with the candles just below it. Beautiful, right? It looks very romantic too. I like this wine rack that can hold plenty of wine bottles. It is also installed in a small corner between the dining area and the kitchen, just above a shabby chic looking cabinet. The kitchen area also has a small bar area that also features an induction cook top as part of the kitchen. You can also see here the wine storage that looks really nice and beautiful. This is one interesting feature of the house because the sink area in the kitchen is hidden within the cabinets. You can see how it works in this gif with the doors opening and closing. In the apartment, there is also a small half-bath that features custom wood cabinetry. The entire house looks really stunning with the use of wood everywhere. Floor-to-ceiling windows are seen in the bedroom but that can be covered at night with white full length curtains. I like the color scheme they used here as well as how wood added appeal to this private area. 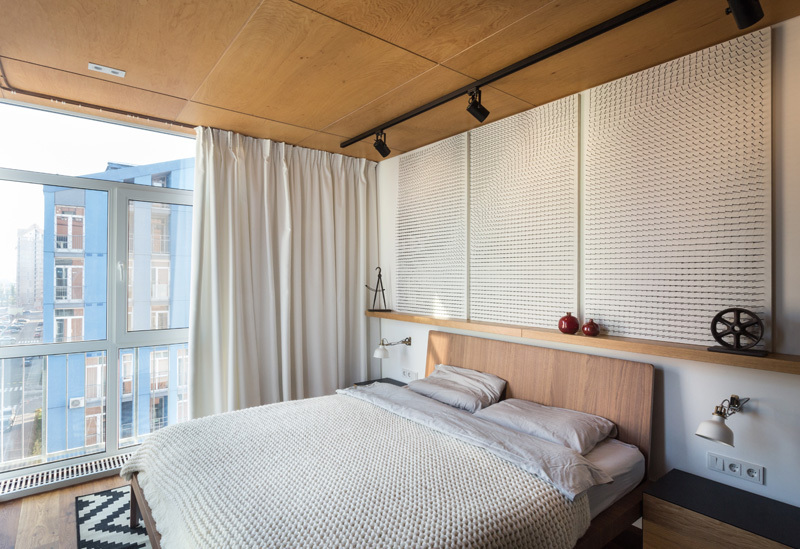 The bedroom has interesting textures and patterns in it giving it an appealing design. You can see the wall arts above the headboard that seems to match the duvet in it. You can also see that it has reading lamps in it as well as a floating shelf. Located just off the bedroom is the main bathroom with interesting ceramic flooring featuring a rustic modern look. Seen here is a wooden free standing vanity in the bathroom that is well lit. Above it are pendant lights that work well with the ceiling lights. 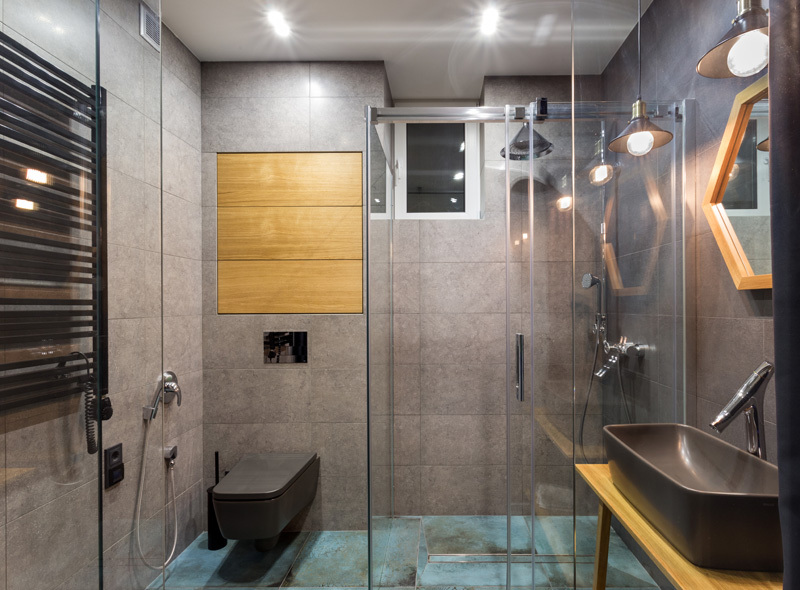 Glass shower enclosures were used in the bathroom which ensures that the light is able to flow in the entire bathroom. You can also see here the combination of various materials and ceramic tiles. Lovely, right? 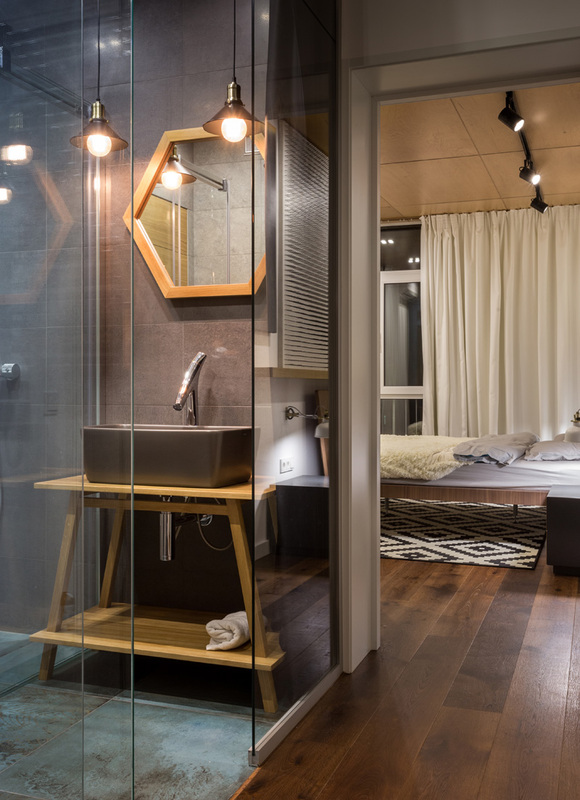 I like the details of the apartment using various materials and textures that when combined, it looked very nice and attractive. 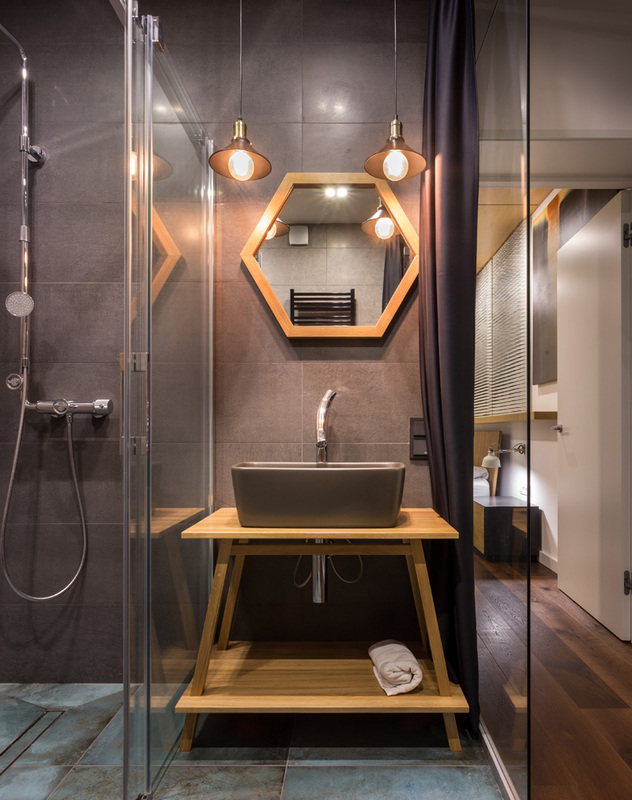 The SVOYA Studio did an amazing job with this apartment transformation and it surely came up with a design that suited to the needs of the owners perfectly. I like how the unfinished concrete looked with the other materials in the apartment as well as the high-quality furniture that was added in the area too. Another impressive feature is the lightings because of how they were arranged around the dwelling. Such a stunning space indeed! How about you, what can you say about the apartment?